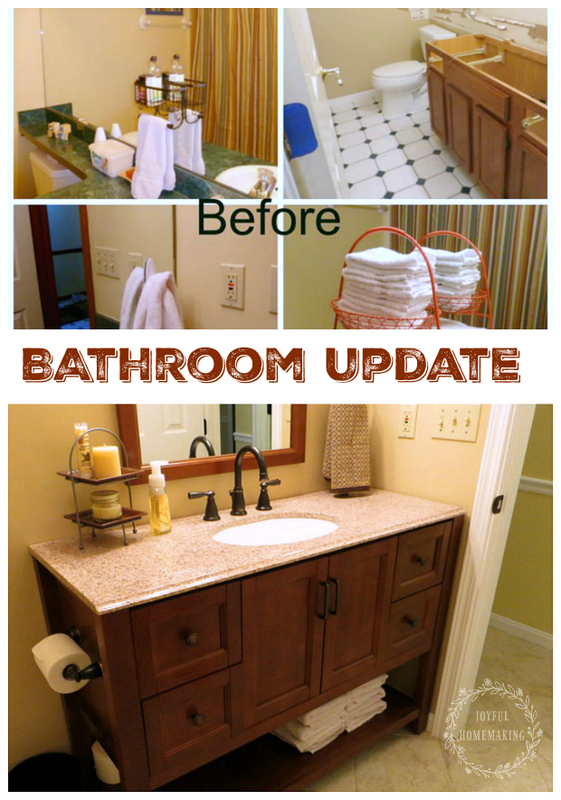 Last week I showed the new floors that we have recently had put in our home to update our look. 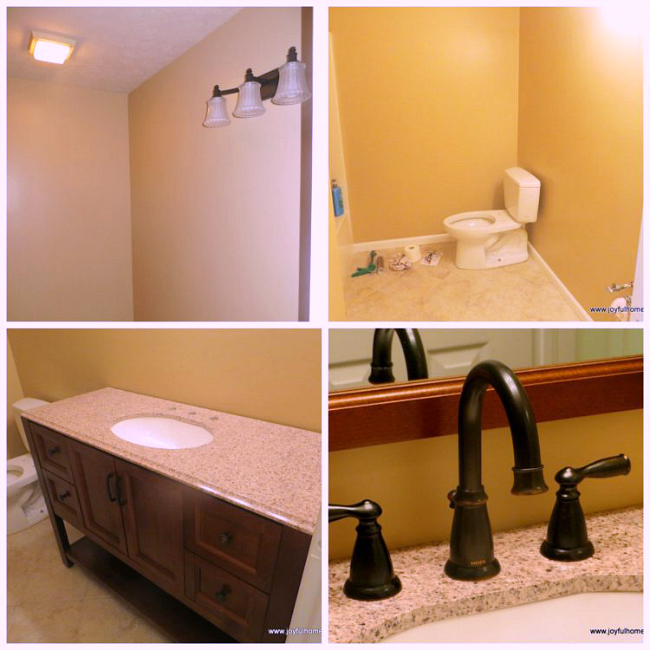 The new flooring extends through a second and third “hallway” (which is our laundry “room”), and into our second bathroom which our children and guests use. 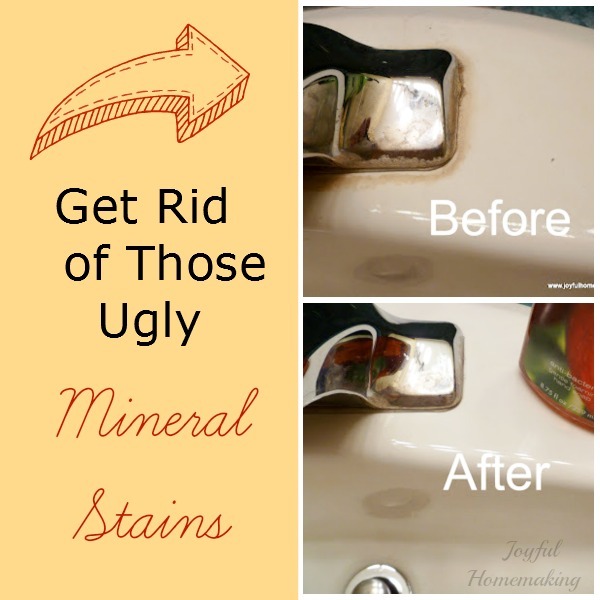 It had this old sink and faucet that looked terrible when you didn’t dry it off every time you used it, because mineral deposits built up, and although I learned what worked great to clean them off, I still wanted a more updated look. 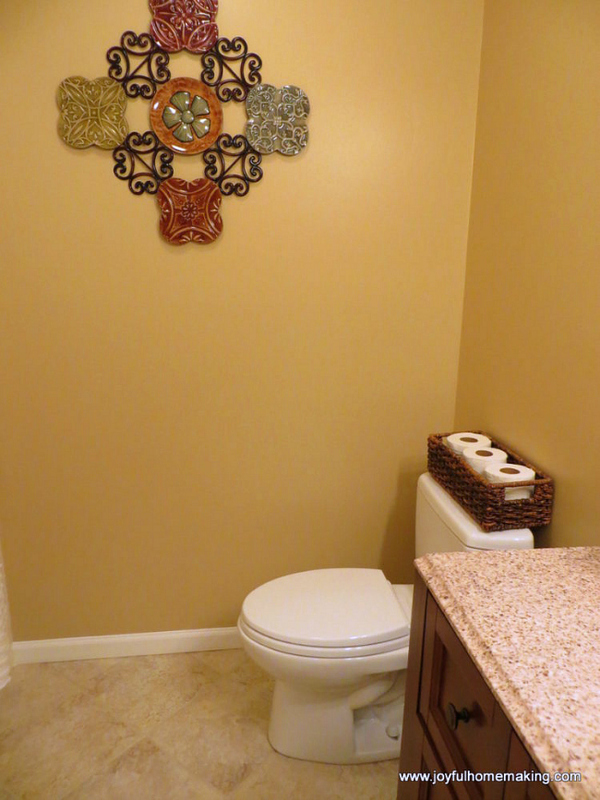 I’m frustrated with myself because I didn’t take a full on before picture of the bathroom. I thought I had one, but didn’t double check, and it turns out, I don’t! I’ve been blogging for almost three years, and you think I would know better, but I gathered some partial photos from some previous posts to give you an idea of what it looked like before. 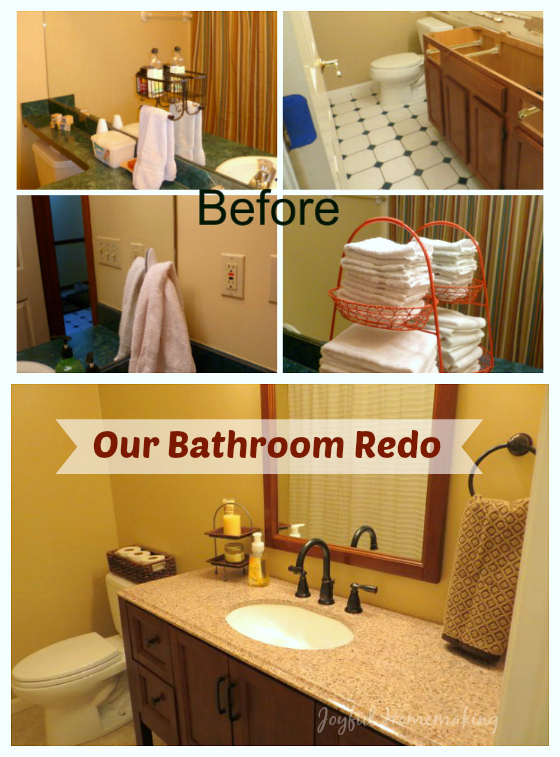 As you can see, it had an ugly faux green marble looking vanity top that went all the way over the top of the toilet, and a white tile floor with dark green diamonds, and towel racks hanging everywhere. Since we were having someone redo the floors, we decided this would be the best time to update the other parts of the bathroom. Before the new floor was put in, we ripped everything out, except the tub and shower. 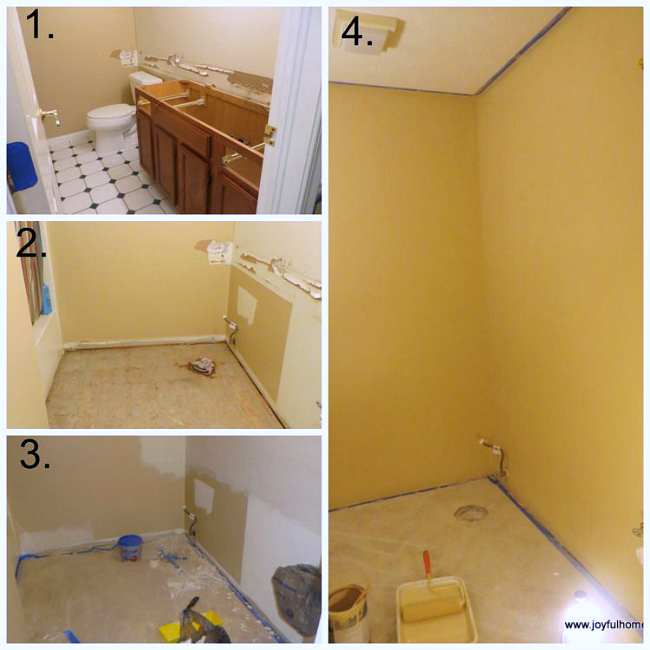 When we took out the old green vanity, it had been glued to the wall, so there was some drywall damage we had to repair and some repainting, which we did after the new floor was in. 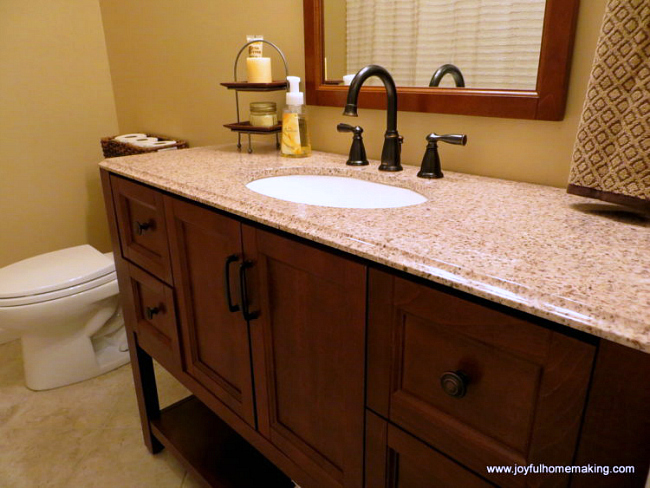 We had to buy a 21 inch deep or less vanity because of the size of the bathroom, and I wanted it 48 inches long for lots of counter space. This turned out to be a lot more challenging than I expected it would be. I ended up compromising on several wishes in order to get close to the look that I wanted, but I’m happy with how it turned out. We ordered a Toto toilet online, and we purchased the vanity combo at Home Depot. 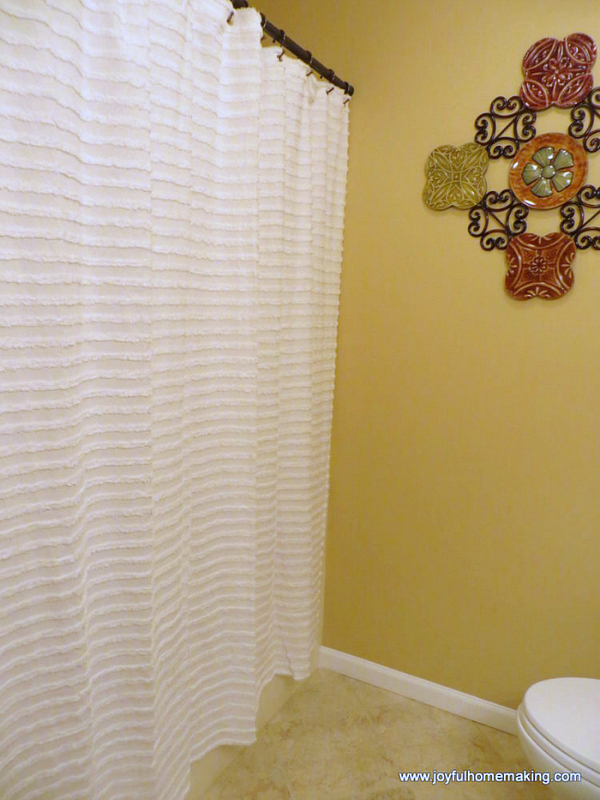 This bathroom has no windows and tends to be a little dark, so I chose a white textured shower curtain from Kohls to lighten things up a bit. We were able to finish the bath up just before my parents came to stay for a week, which worked out perfectly because everything was new and fresh for them! I’m not sure I’m done with decorating and shelves in here, but we’re kind of using it for awhile to see what we still need for function and decor. 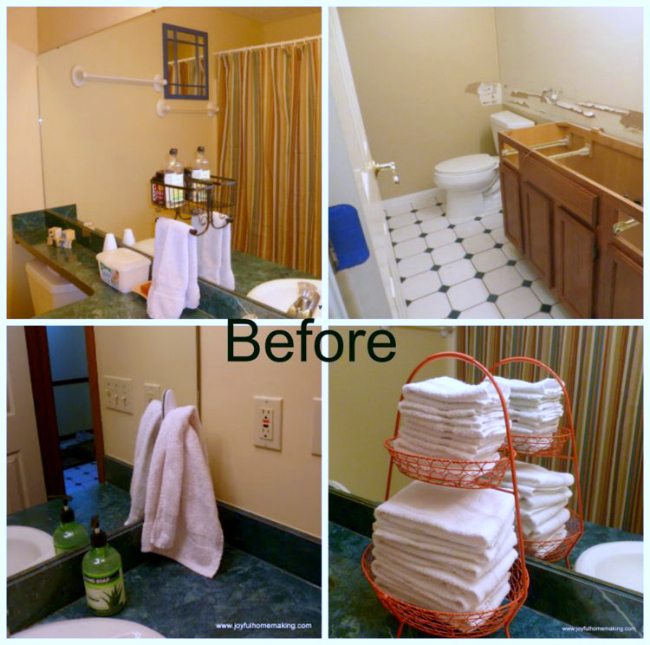 I’m not a “decorator” but I do want things to look nice, and it may sound funny, but I kind of wanted a “hotel” bathroom look. We’ve done a couple more updates which I can’t wait to show you! Lovely transformation!! Love the vanity! Wow! What a difference. 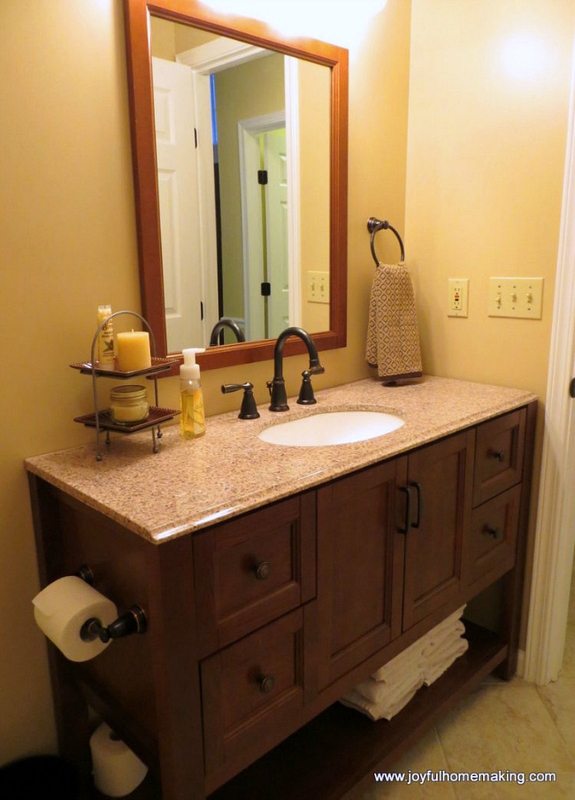 I love the vanity and your choice of hardware. It came out fantastic! Very pretty! I really like the vanity. Your old bathroom reminds me of our upstairs one. 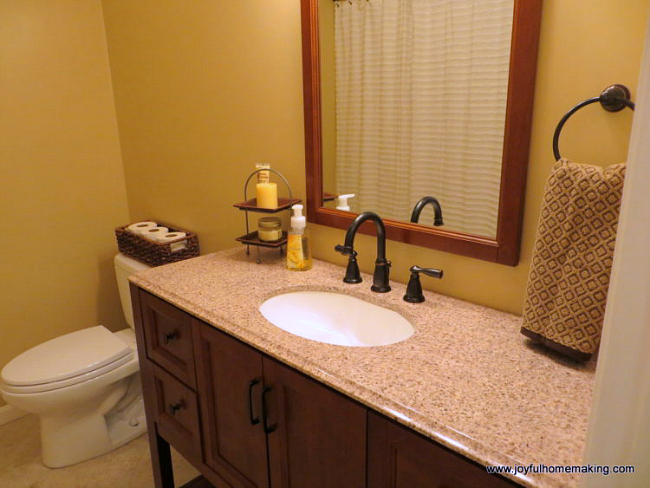 We did update our floor with tile a couple of years ago but the vanity is still not so nice. We are planning on moving though and building a new house so I think we will leave it alone. Thank you! I know how you feel about making any changes if you’re going to move! Love, love your new bathroom. 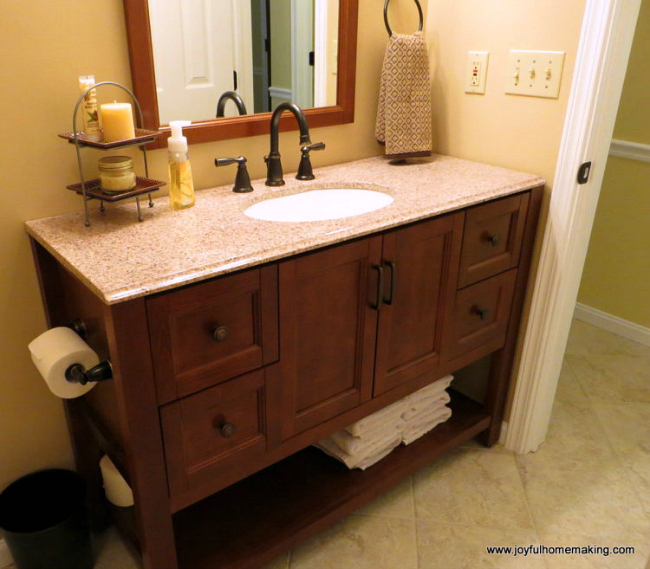 I like that the vanity has so much storage. I know what you mean about not having any windows in your bathroom. I have two bathrooms with no window. The bathroom looks great. I have a quick question if I may. I noticed you removed the old builder’s grade mirror. Do you have any tips for doing this?